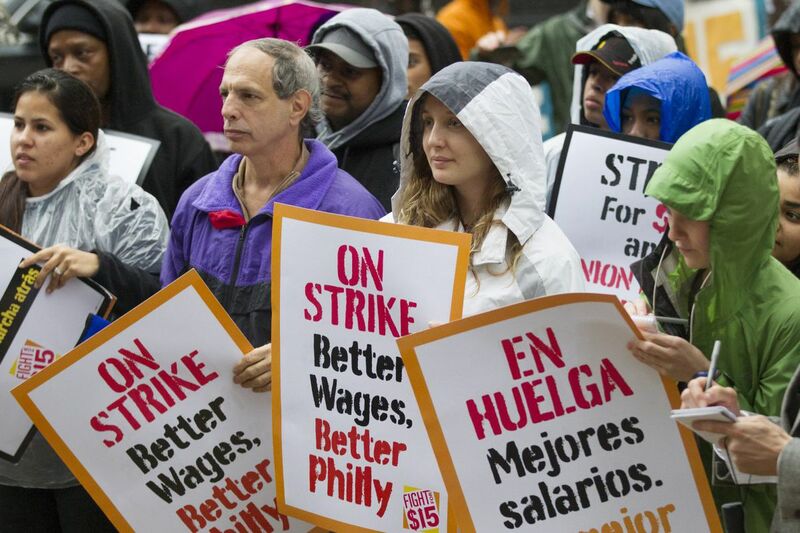 “Fast-food workers, municipal subcontractors, airport workers, and those in the health-care field must be compensated for the hard work that they do each and every day,” writes Gregory Holston. I was born into a family of hard-working people. I grew up watching the people I loved make sacrifices, day in and day out, to ensure that I'd have a better future than they. My mother, a hospital nurse and member of the American Federation of State, County and Municipal Employees (AFSCME), was proud of her union work. Without the stability gained from her union membership and employment, I would not be where I am today. I would not have had the freedom and flexibility to explore my path, which eventually led to the church and to education. As a former member of the Philadelphia Federation of Teachers, I believe it is now my generation's turn to continue the efforts of ensuring that the ability to create a stable home is available to all of God's children. We must ensure that all parents have the opportunity to provide for their family, as my parents provided for my siblings and me. With an all-time union membership low, at 10 percent of the workforce, our nation is struggling to find ways to boost our economy. I see unionization as just that: Bringing more money into our economy and into the pockets of the people who wouldn't spend it on stocks or future investments but instead would like to see food on their tables or Christmas presents for their children. For too long, big corporations and right-wing politicians have fought, hand in hand, against unions. Today, as a united force we must halt this malicious collaboration. When 60 percent of Americans are in favor of unions one would think that it would make sense for politicians to follow the choice of their constituents. Sadly, that is not the case. By continuing to join hands with big corporations, our politicians are hurting those most vulnerable, taking advantage of those held down by the rigged system we live in. This Labor Day, we, here in Pennsylvania will be working toward a more equitable minimum wage of $15 an hour. Fast-food workers, municipal subcontractors, airport workers, and those in the health-care field must be compensated for the hard work they do each and every day. Politicians often take pride in discussing our manufacturing and industrial base, our nation's history. However, our past will not return to save us; instead, when seeking hope and possibilities, we must look to the future. Service workers and health-care workers are the fastest-growing sectors of jobs today, and we must find a way to turn these jobs into good-paying careers that serve not only owners but also employees. If we truly want to rebuild the middle class and eradicate the deep poverty that plagues our city, we must support workers who are organizing at places such as the airport, fast-food restaurants, and hospitals. These are the factories of our time. And while many politicians romanticize manufacturing, it is important to remember that these were once places full of dirty, dangerous, poverty jobs until workers organized into unions. Unions built the middle class in the 20th century — and if we refuse to allow their destruction at the hands of right-wing extremists — unions can rebuild the middle class in the 21st century. In having the ability to organize we, as Americans, are practicing what our forefathers had to do in secret while ruled by Britain. If we live in a country that prides itself on freedom, why do we limit our ability to work together to gain a better living for our families? Why do we allow our elected officials to pass anti-collective bargaining laws? How can we allow workers to lose the ability to spend their weekends with the children they work so hard to support? How can this all happen as so many of us sit idly by? We must bring our country to a more just place. We must stand with our hard-working brothers and sisters to move forward, one step at a time. We must see and understand the causes of our nation's wealth inequality. We must research and discover the roots that created the problem. We must fight as hard as we can to change this reality into one we are happy living in. If we are not all moving forward together, we surely are not moving at all. We cannot let down the people who work so hard to achieve as much as they can with their time on Earth. We must lift up these brothers and sisters. We must fight as hard as we can to raise the minimum wage, to create new jobs, and to ensure the rights of workers across our state. We cannot continue on our current path. We must forge a new and equitable future.